Like many of us, I sometimes learn by trial and error. Such was my experience when choosing a windshield for my new GT200. My first purchase, given the way it looks, was to buy and install the smoke FACO mid-sized. It looked great, but directed the flow of air, given my height, just at ear and eye level, resulting in an incredible increase in wind noise and produced such tearing in my eyes (I wear glasses under my 3/4 face helmet), that it was truly unsafe to drive at anything above 40 mph. 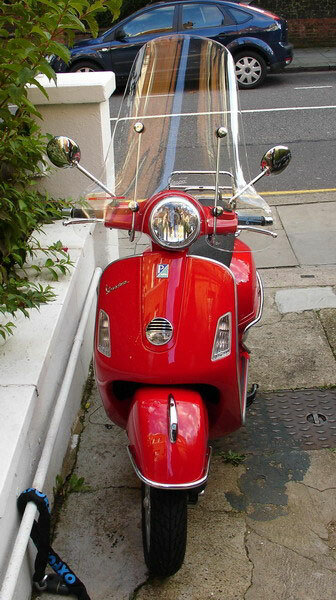 My second purchase was the Vespa Tall....and tall it is! I looked through the windshield....not over it. Distortion wasn't bad, and wind noise was almost non-existent. 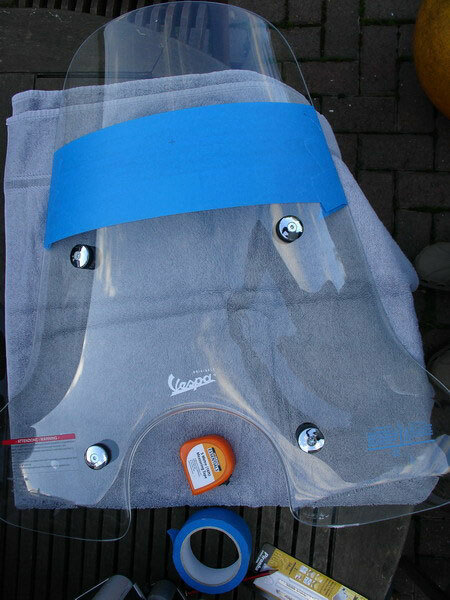 In addition, the shape provided some additional protection for the hands during cold-weather riding. However, looking through the windshield produced poor visibility during rain, especially at night. In addition, the height of the windshield produced some bending and fluttering of the lexan at speed. And finally....there was that warning sticker that indicated the scooter to which the windshield was attached should never exceed 100 kph (approximately 60 mph). My solution? 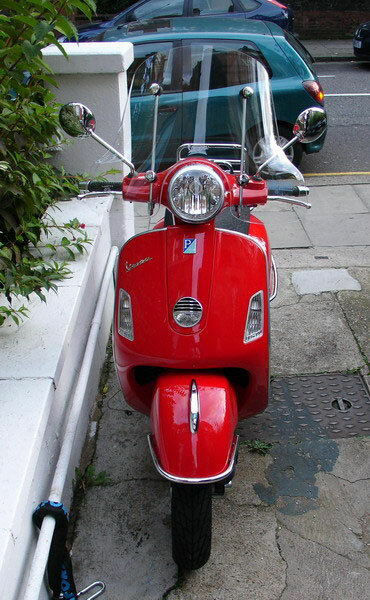 Cut down the Vespa Tall Windshield. 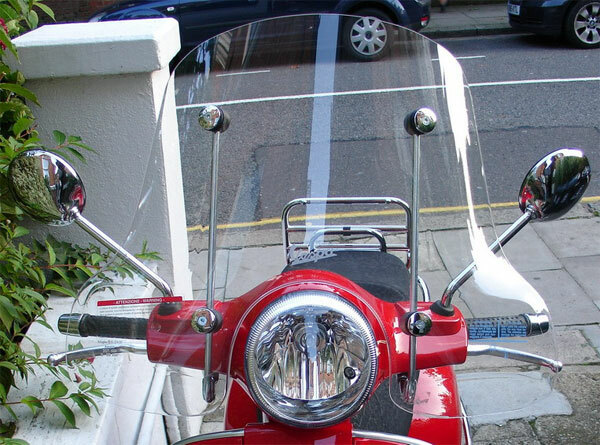 During my 40+ years of motorcycling, I learned that if you could peer over the top edge of any windshield and see a spot approximately 25-30' ahead of you on the road, the windshield would be of correct height. So....out into the street I went with GT200 and measuring tape. Picking out a spot at an appropriate distance ahead, I measured down from the top edge to the point where I was looking through the windshield. For my height (5'11"), that point was 4.5" below the top edge. 1, Removed tall windshield, leaving brackets in place. 2. Placed blue painters tape in a swatch about 12" wide over the place where I estimated the cut would be made. 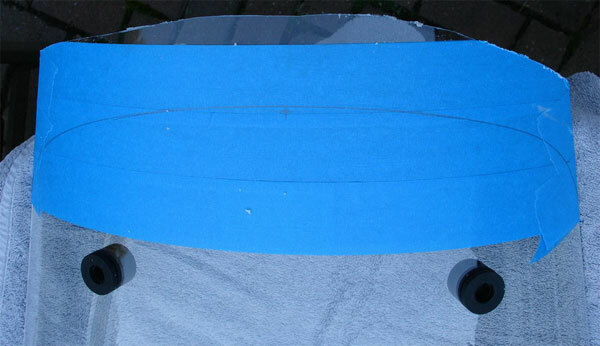 (The tape will prevent the foot of the jigsaw from scratching the lexan, and will also produce a cleaner cut). 3. I made a paper template by tracing the top contour of the windshield onto construction paper. Then marking a spot on the tape about 4.5" from the top, traced the contour onto the blue tape so as to have a line to follow while making the cut. 4. I carefully cut the new contour using a fine-tooth blade on my jigsaw (24 teeth per inch), being very careful not to hurry and to let the saw be the one who did the work. 5. After cutting, I left the tape in place and attached the windshield to the mounting brackets. 6. Using a sanding block and medium and fine sandpaper, I smoothed all the freshly-cut edges and made minor adjustments to the contour until I was satisfied. I then removed the tape, cleaned the windshield and went for a test ride. My test ride was in 65 degree weather with a light rain and 25-30 mph crosswinds (Ernesto approaches!). The wind noise was almost non-existent, just like it had been before the cut-down. The air flowed up and over the top of my helmet, carrying most of the rain with it. If I wanted to, I could "slouch" just a little and eliminate all the effects of the rain on my helmet and face. I had road room to achieve a speed of 65 mph, and felt absolutely no ill effects on handling, even with some pretty substantial cross winds. I would feel very comfortable using it at any speed up to the GT's advertised maximum. Finally, almost all of the lexan flex and flutter had disappeared, given a reduced surface area with the same supports. Delaware Don and London Charles! Part 6: Close up - smooth edge! Part 7: Finished, looks much more in proportion now!